I am a breakfast-cake kind of gal. My mother, never an ounce above 95 pounds no matter what she eats, is always buying some type of scone, decadent kringle, or twisty cinnamon concoction from the town’s highest quality French pastry shop. I beg her to desist; my fingers are just as sticky as the cinnamon. 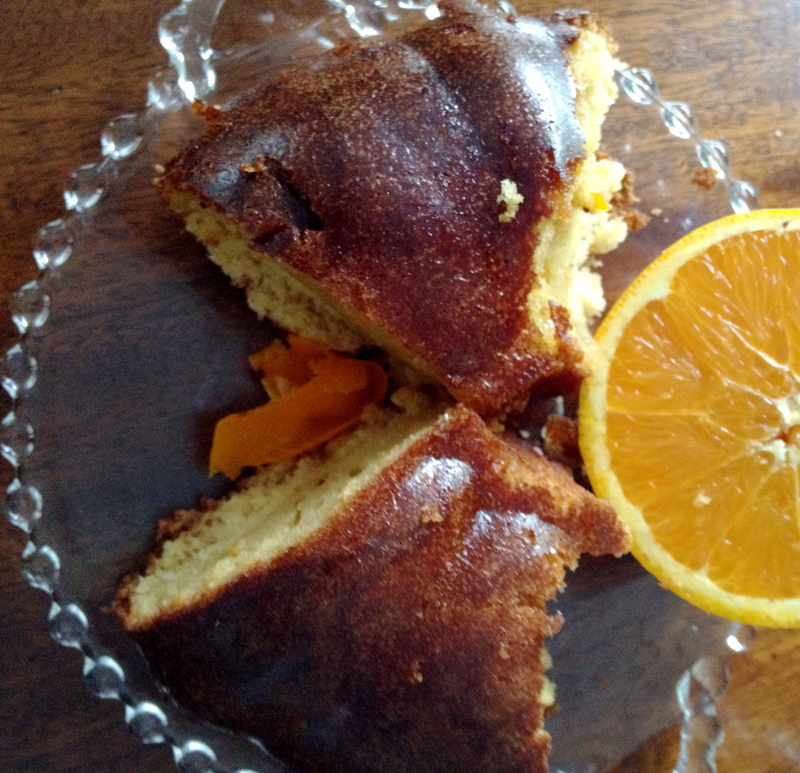 This orange cake is not quite as dangerous as a chocolate croissant, save for the sugary orange glaze poured on at the last minute. 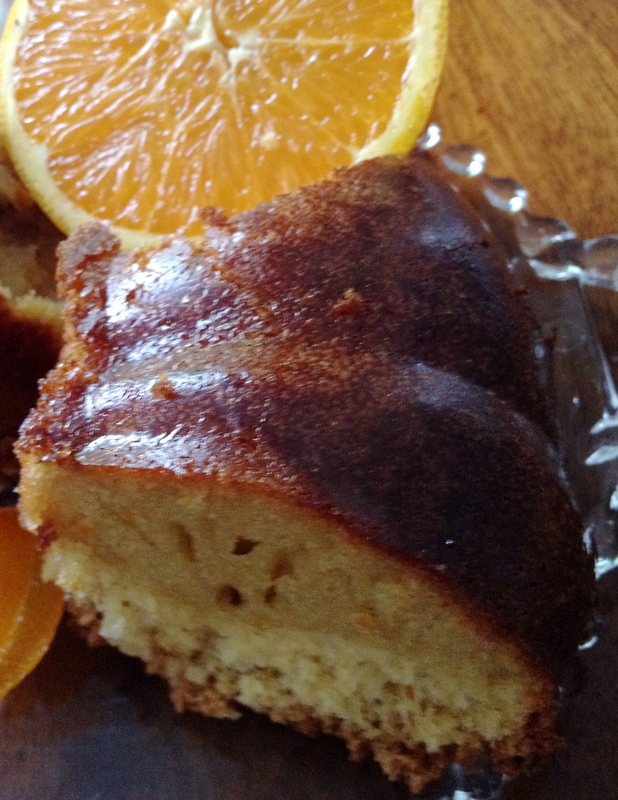 The glaze moistens the cake and makes it all the more difficult to deny. Recipe: Pre-heat the oven to 350 degrees F. Lightly grease a loaf pan or bundt pan and cover with parchment paper (unless using a bundt pan, in which case greasing it is just fine.) In a medium bowl, combine the flours, baking powder, baking soda, and salt. In the bowl of a stand mixer fitted with the paddle attachment, mix the eggs with the sugars on medium speed until light and fluffy. Add the canola oil and vanilla until smoothly combined. Add the orange juice and all but 1 tablespoon of the zest and combine on low speed. With the mixer on low, slowly incorporate the dry ingredients a little at a time. When the ingredients are evenly combined, pour into the prepared pan and bake for 30 minutes or until a toothpick comes out nearly clean. In a double boiler (place a heat-proof bowl over a small pot of water over medium heat), mix the 1 tablespoon sugar with the reserved tablespoon of orange zest and spoonful of orange juice. Add a spoonful of water if the glaze becomes too thick. Gently stir until the glaze is consistent and warm. It need not be thick. It is fine if it is thin, it will make it easier to pour. Let the cake cool for 15 minutes in the pan before inverting it onto a rack to cool further. Pour the glaze over the cake and enjoy.